Boo! I hope everyone had a great Halloween. Be sure to scare up a fun game this week! NEW Sci-Fi Gaming Terrain Available NOW! Remember: every bad gamemaster is a good gamemaster with a few select bad habits. One of the most blatant examples of GM favoritism involves myself. I admit that I am a bad gamemaster. In one case, I asked my girlfriend to try joining my campaign. She agreed only on the condition that she play as a fairy with a magic wand that creates flowers on everything it touches. Because my girlfriend was _so_ fond of fairies, I also knew that any harm coming to this character would result in even more harm to me. So, I announced to my regular players that my girlfriend would be sitting in with us and that I did intend to perform blatant acts of favoritism. My girlfriend brought to the table a character I converted myself but which violated numerous character creation rules. In a Rifts: New West setting she was playing a Silver Bell fairy with a rune wand and immunity to all harm, plus regular fairy magic. She seemed to have fun, and the other players accepted the situation. She quit after that one session, however, and claimed personality differences with the other players. The players immediately afterward decided to rotate me out of the GM’s chair.Another example of favoritism occurred near the same time. I once played in a very short Dungeons and Dragons 3rd edition game in which a guy named Odin ran me and another player through a dungeon module. Odin sent an NPC with us who was a twentieth level everything – yes, everything. The NPC was actually King Arthur suffering from a case of multiple personality disorder. Basically, Arthur cut through the dungeon while our single class, first level characters followed him and watched. And now for something completely different. My first experience with a tabletop roleplaying was in college when I observed a gaming group for a sociology paper. Following that, I became a player in a Robotech RPG game run by a fellow named James. It was an interesting game in which conspirators from Australia took over the earth with psionic Zwarth mecha, and an NPC smoked the Flower of Life, but it had huge problems with mechanics. James’ game, had it been my first roleplaying experience, probably would convinced me to quit then. James earned the title of worst single gamemaster I have ever seen; he transcends normal classification, and crosses into almost every category of bad GM I have identified. Then he stole my books. One of James’ most bizarre habits was his favoritism. James had a thing for swords. He was convinced that a sword was an infinitely superior weapon to a gun. Whenever battle erupted, the character with the sword always attacked first. If I had a rifle prepped and pointed at the opponent, the guy with the pointy stick could draw his weapon, close the distance across a battlefield, and strike me before I could get off a shot. What is particularly strange was that he was running Palladium Book’s Robotech RPG, a game in which swords aren’t even listed in the equipment section and mostly unavailable. Feasibility issues aside, James’ swords point to another clear cut case of favoritism. Favoritism is a complicated issue. Like most bad gamemasters, a favoring GM is usually well-meaning and sometimes unaware of a problem. There are many different forms of GM favoritism. Some amount of GM favoritism is to be found in any campaign, but blatant favoritism causes resentment in most players.The most obvious and disliked form of GM favoritism is favoring one player or player character over another. This may simply be one player in the group always getting the cool magic loot, excessive experience points, or apparent immortality. These things only bother players when they see their own characters (or characters of other players) treated differently in similar situations. In contrast with the act of favoring a player over others, a gamemaster might favor a particular NPC over everyone else. Odin’s ultimate fighter/thief/magic user/cleric demonstrates this perfectly. 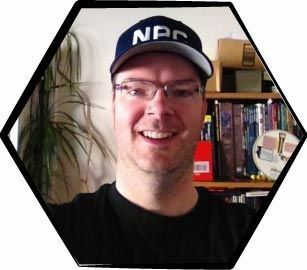 In almost any campaign, the characters will be expected to encounter NPCs who are more experienced and powerful than themselves, but the super-NPCs don’t belong in the party. Favoring a particular story element is a more subtle form of GM favoritism than favoring a player or character. My first gamemaster, James, has generously provided this article with the example of his favoring swords over guns to a ridiculous extreme. Some gamemasters favor a particular setting over others and remain there until well after the players are bored with it. One of the classic scenarios of GM favoritism is magic vs. technology. In games in which these two elements are supposed to be balanced, many gamemasters still have one (most often magic) completely overpower the other. The worst violation of player equality, however, is unequal face time. What should players do if they realize that they are always sidekicks of a central PC hero? In the case of the Gearkreig RPG, one of the character templates is “Sidekick” and such a character should be expected to allow other players more limelight from time to time. Even a sidekick, however, should have some fun. If the gamemaster directs the majority of his words to a single player, the slighted players will soon begin to feel that they are wasting their time. There will always be situations in which one character will dominate a part of a campaign, but if the trend lasts for more than a single game session, then the favored PC is begging for an assassination. Most bad gamemasters don’t realize they are creating a problem but merely see the players getting more and more aggravated. Approach your gamemaster at a convenient time apart from the regular game sessions. Prepare a list of grievances (which you may call “concerns” for diplomacy) and specific examples of when you thought that he displayed unfair favoritism. If one player is receiving all of the attention, it may be because the GM’s style differs from the gaming group’s style. Not every GM will ask, “What are you doing?” Instead, your gamemaster might be waiting for you to declare an action! Sometimes, it’s better to join the darkness than fight against it. If your gamemaster has a hang up with swords, ask about learning to use a sword. If your gamemaster is firm set to his belief that magic spells can bring down a technology-produced force field, but technology is useless against a magic force field, ask about a *magical* power source for your laser rifle. You might like it better his way. In a worst case scenario, you still wouldn’t be having less fun than before you sold your soul to the GM for a magic sword. Or, you could rule that some groups are much closer than that, but it will somehow tend to that in the future (see point 8). As far as I understand it, politics is being played by someone lower in the scale trying to discredit someone higher. There are several means to achieve that, and each method yields a number of additional points to the winner, the same amount being subtracted from the loser. A must make an easy check (Intelligence, Etiquette, Innuendo, Social…) to receive the point B will lose. Should A fail his check, it either means that nobody understood the insult or that someone came to the rescue of B: “Yes, but if the mortar is as thick as your wine, a fly could knock the wall down….” In that case, B wins (unknowingly) a point and A loses it. Minor incapacity. A puts one of B’s minions out of the way and replaces her by one of his group. The minion should not be harmed but only neutralised temporarily. For example, A puts a sleeping draught in the wine of B’s bard who falls before his performance for the King. Luckily, A had her own singer handy. A must make a check (whatever suitable). If he fails, the plot is discovered and B gains the point (and A loses). This can induce investigation. Should A’s culpability be ascertained, he loses 2 points but B gains nothing as he will still be laughed at for falling. Major incapacity/Duel. Same as above, but the incapacitated victim is more than a mere minion of B. Financial coup. A manages to make B lose a lot of money, either by making a contract superseding B’s, or by destroying B’s goods. Either way, a check should occur with B at a penalty. Minor neutralisation. As Minor incapacity above except that B’s minion is killed, maimed, or made to flee the area. Head incapacity/Duel. Same as Major Incapacity, but the incapacitated victim is the head of group B. Major neutralisation. Same as Minor neutralisation, but the killed/maimed/exiled victim is more than a mere minion of B. How to handle politics in game: the political turn. Depending on your setting, you should decide on the length of the political turn. A week might be a good period, while in some cases you could use one day or one month in a high/low political land.At the beginning of each turn, roll randomly for A, B, and the event. Should A and B be in the same group, it means that the group splits into Aa and Ab unless the event is an alliance, in which case either re-roll or ignore. 10     Roll thrice, ignore, or reroll (your choice). Well that’s it. I welcome any additions to the event chart and hope that this might be useful. Blood = Family, Relation, Mentor, Slave/Master, etc. Money = Paid to do it, wants money or power, etc. Pledge = Honor, Vengeance, Oath, Religion, etc. Using these as a base, you can come up with unique secrets and reasons for character motivations. Something I have found to be useful is the Dollar Store. You can buy bags of 50-100 army men of various colors or types for $1-2 and sometimes animals for those pesky Druids in the party (or, in my case, a Druid/Shifter). The men work great for those situations when you have a large number of “goons” or generic people involved with the characters. Different colors help you keep track of the different kinds of “goons”. Green could be “commoners”, Blue could be “cops”, Beige/White could be “aristocrats”, Red could be shopkeepers. The animals are great because it is nearly impossible to find good animal miniatures. Advice: If you decide to use these kind of miniatures, try gluing them to standard size poker chips for large creatures, and smaller chips for medium size. I have a nice, cheap solution to your battlemat problems that everyone runs into. You can take a battlemat, either purchased or homemade, to an office shop like Kinko’s, and have them laminate it with the second width they offer. It cost me about $9.00 and now we have a battlemat that you can write on with Dry-Erase markers. I have found, however, that black markers work the best. They come off easier. Red doesn’t work at all. Black “Expo” brand markers work the best out of all I have tried. Need advice fast? Inbox full? Hard Drive crashed? Missing valuable Roleplaying Tips issues? Fear not! by Issue#, Tip Topic, Type Of Tip, and more. In an upcoming issue, I’d like to discuss the best ideas for handling split parties. What can a GM do when three characters decide to go left, and two go right? What GMing practices and techniques have worked well for you? What things have you tried that did not work well?